A new "Summer Essential" -- Identity Theft Protection | Benefit Resource, Inc.
Last week I received a little alert “Review Your Identity: A match has been found to your monitored information”. A slight wave of panic sets in and the thought of financial ruin crosses my mind. I quickly login to my Mastercard ID Theft ProtectionTM service to check on the detail. As I log in, I learn that a personal email address had been compromised at a third party site. I am instructed to change the password on that site and any other site that may use the same email and/or password. I make the recommended changes and feel a sense of relief…but not every situation is so simple. Your identity is no longer made up of a couple credit cards and account numbers. Identity theft comes in all shapes these days. As the weather heats up, make sure you put ID Theft Monitoring on your list of “Summer Essentials”. What information should you be protecting? Financial and medical accounts: We all know that we should protect our credit cards, debit cards and bank account numbers. Financial accounts have been a target for identity thieves looking for a quick return. Thieves will often try to drain accounts or max out limits before any theft is detected. Fraud and transaction monitoring at financial institutions and credit card companies is helping to limit the losses a person might experience. There is also a growing trend towards medical account theft in which identity thieves will use a person’s medical or insurance information to make false claims against your identity. Secure personal information: This includes information such as date of birth, street address, social security numbers and phone numbers. Identity thieves will use this type of information in an attempt to create new accounts or credit cards in a person’s name without their knowledge. Personal identifying details: This includes things such as email, usernames and social media accounts. This information can play a role in understanding who you are. Those little security questions “What is your favorite food?”, “What is your hometown?” can often be uncovered by identity thieves who might view your profile. Create strong passwords: Strong passwords should contain a combination of uppercase and lowercase, numbers and potentially symbols. Passwords should not contain: strings of numbers or letters (i.e. password1234), all or portions of your name (or a nickname that is widely known), or date of birth. Vary passwords and change them regularly: Avoid using the same username and password for accessing multiple accounts. When one account is compromised, all of the accounts become compromised. Get in the habit of changing passwords every 60-90 days. Be cautious with new sites: When making purchases online or even subscribing to services, be cautious in your interactions. What information are you asked to supply? How is the site secured? Is payment made directly through the site or through a third party application? Check out BBB.org: When you have not worked with a company before, you may want to check out complaints at the Better Business Bureau. You may also read “online reviews” but be cautious when a company receives many vague positive comments. If an identity thief is trying to pose as a reputable company, they may also be paying to have false reviews posted. Monitor your activity: It is important to closely monitor all activity in your bank accounts, credit cards, medical accounts and other transactional accounts. Promptly notify the respective company of any unknown activity you may detect. In many cases, your exposure for losses is based on how quickly you notify the company. Be careful of what you post: Through social media, people are posting very detailed things about their lives. It is important to understand what you are posting, how it could be used and who might be able to see it. If you are not sure who can view your information and posts, you may want to check your privacy settings. Use an identity monitoring service: There are a number of identity theft monitoring services you can subscribe to. 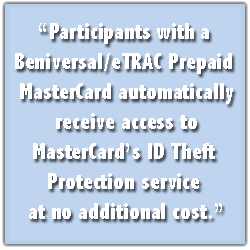 All Benefit Resource participants with a Beniversal/eTRAC Prepaid Mastercard automatically receive access to Mastercard’s ID Theft Protection service at no additional cost. Mastercard’s ID Theft Protection service includes ID theft monitoring services, emergency wallet replacement services and identity repair services. This comprehensive service allows you to determine what information you want monitored. This may include: account numbers, social security numbers, credit cards (including all brands), medical IDs, email addresses and physical addresses. Be sure to add ID Theft Monitoring to your list of “Summer Essentials”.